The Java Ternary Operator is also called as Conditional Operator. The Ternary Operator in Java programming is mostly used in decision making process. If the given test condition is true then it will return statement1 and if the condition is false then statement2 is returned. In this Java Program, we are going to use the Java Conditional Operator to find whether the person is eligible to vote or not.
" You are eligible to Vote "
If he / she enters below 18 then second statement (which is after the : symbol) will be assigned to String variable Message. 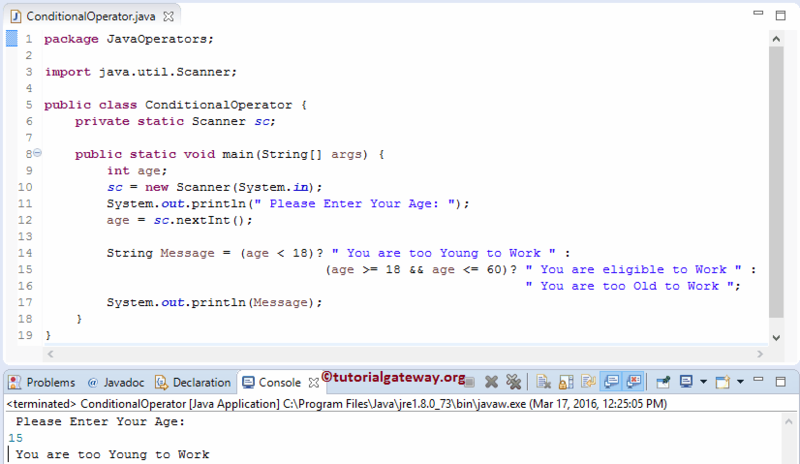 In this Java Program, we are going to use the Nested Conditional Operator in Java to find whether the person is eligible to work or not. In this java ternary operator example, We declared a string variable called Message and we assigned this variable to the conditional operator functionality. If the Nested condition of a java conditional operator fails then it will execute the variable after the : symbol, which is You are too Old to Work.